Santa Barbara Landscaping Mistakes | Landscaping in Santa Barbara | Down to Earth Landscaping Inc.
You are here: Home / Garden Maintenence / Top 5 Landscaping Mistakes in Santa Barbara. 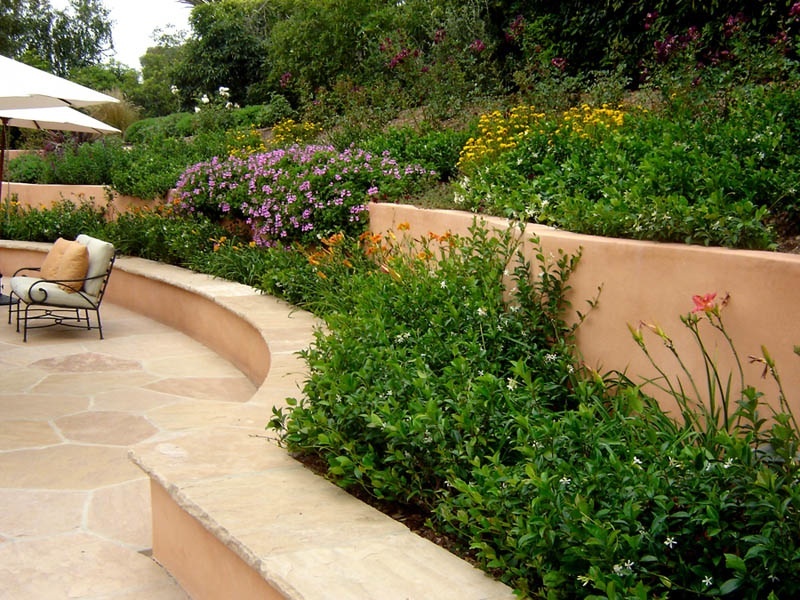 Top 5 Landscaping Mistakes in Santa Barbara. Landscaping Mistakes are costly. This blog will help Santa Barbara homeowners avoid making serious landscaping mistakes when starting a outdoor project. Unlicensed contractors routinely provide a business license number that is not a contractor’s license number. Unlicensed laborers may cause you to be financially responsible for injuries, fire, or property damage. Unlicensed contractors usually don’t carry workers compensation insurance or liability insurance. Always hire a licensed landscape contractor! Licensed Landscape Contractors are trained to provide grading services, install planting and irrigation, and construct structural elements of design. Some may also be certified in landscape design or irrigation. Certification means they have had additional training in these areas by a trade association such as the Irrigation Association or California Landscape Contractors Association. Landscaping Mistake #2: Choosing the Wrong Plants for Your Yard. Another key to a successful landscape project is choosing the right plant for the right place on your property. Selecting plants that are adapted to your local conditions will grow better, require less maintenance and use fewer inputs such as less water, fertilizers, and pesticides. Climate – always select trees, shrubs and other plants that can withstand the temperature and other climatic extremes in your region. Micro-climate – consider the micro-climates of your yard, such as sun and wind exposure and choose the appropriate plants for the appropriate place in your plan. Water needs – group plants in your landscape design according to their water needs or the “hydrozones” so they can be watered efficiently. Avoid high water-using plants. Soil and drainage – consider the soil preference of the plants you select. Some plans thrive in well drained sandy soils, while others prefer moist clay soils. Most prefer something in between known as loam. Placement in the Landscape – know the plant’s growth potential and provide enough space it to reach its ultimate width and height. This will allow the plants to achieve their natural shape (and save you years of pruning!). If there is no landscape water drainage in place, homeowners are at risk of damaging their homes structure and losing plants, flowers and trees. Landscape water drainage systems are perfect for the removal of water in areas of your landscape which are low and prone to flooding. Prevent muddy patches from forming due to heavy rain. Reduces the risks of fungal diseases of the lawn by removing the water away from the landscape. Prevents the threat of moss and algae build up on a deck, pavement or driveway. Deck and patio drainage will help prevent rotting and eroding of a timber deck or house siding. Before you plant, decide how you will water your new landscape. There are two basic ways to accomplish this task: manual watering with hoses and sprinklers, or by an in-ground automatic irrigation system. Landscapes account for an average of 50 percent of residential water use, so it’s important to design and operate the irrigation systems as efficient as possible. Whether you intend to install one yourself or hire a landscape contractor, this section provides important advice. The mistake homeowners make is not watering their new landscaping properly. Even if you’ve selected low-water using plants for your new landscape, you will need to water them for the first year or two until their roots are established. Medium and high water using plants such as turf and annuals will require frequent watering during the hot summer months, even after they are established unless your climate has regular rainfall during these months. Although maintenance is the last landscaping mistake listed, it’s very important. Why? Most homeowners forget that it takes a skilled landscaper to nurture and tend the garden for it to stay as beautiful and the day it first goes in. Just don’t spend the money and time and neglect to properly maintain your new landscape. Ongoing maintenance of your newly installed landscape will give you years of outdoor beauty and enjoyment. We are here to help. Call us with any landscaping questions.